Today the ABC’s Catalyst TV crew visited the Exertion Games Lab to shoot video footage of Joggobot, the flying robot that is a social companion for joggers. 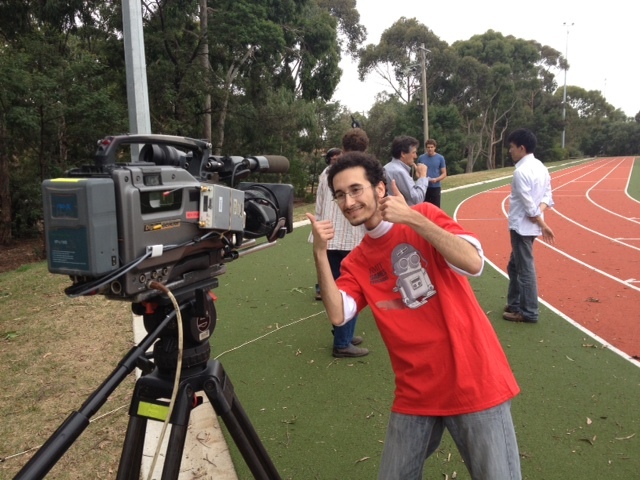 “Catalyst is a program that sees science as a dynamic force changing our world.” They were very engaged, and spent the entire day in the lab, shooting footage of how we developed the idea of Joggobot, people’s perceptions of the Joggobot on a running track (see picture) and tested it themselves in our gym. Unfortunately Eberhard, the main creator behind Joggobot could not have been there, but we highlighted him many times!